Dark days for Match & More. Currently I am mourning the changes to Morrisons Match & More card, which no longer matches and now doesn’t give me more. match the discounters Aldi and Lidl using its loyalty card. the difference in “Match” points on my loyalty card. This was good news for me, as Morrisons is much nearer and easier for me to get to than branches of Aldi or Lidl. often, but also on supermarket own brand products and fresh produce. I could hardly believe my luck when it was introduced last year – a loyalty scheme perfect for cheapskates like me. Now however Morrisons have wised up, ditched the price matching and introduced a new scheme. Under the new scheme, shoppers are rewarded based on how much they spend at Morrisons, rather than how much they might have saved when shopping elsewhere. The “Match” points, that refunded the difference compared to prices at Aldi and Lidl, have been scrapped, but Morrisons will continue handing out “More” points if you buy specific promoted products. Morrisons is keen to point out that the shiny new scheme is much simpler, and also rewards shoppers for all spending, not just the price matching when the total tips over £15. announced on Mirror Online over here: http://www.mirror.co.uk/money/morrisons-ditching-aldi-lidl-match-6579111. In fact I was so cross that I went away and dug out my receipts, checked my points online, and attempted to work out how much I’d benefit under the new scheme rather than the old version. So cross I checked the receipts. Old scheme: £50 Match & More vouchers. Hurrah! Since I started using a Morrisons Match & More card in December last year, I calculate I’ve spent just over £1,080 at Morrisons on shopping trips worth more than £15 (the threshold when the price matching part of the old scheme kicked in), plus another £280 that didn’t count, because each shopping trip was worth less than £15. In exchange, I racked up enough points for Morrisons to dole out £50 in Match & More vouchers to spend on shopping, plus another £32 in coupons like “£3 off a £30 spend”. So the good news is that membership of Match & More has saved me 6% on my shopping so far (£82 divided by a total spend of £1,360). The bad news is that the vast majority of the points that generated my £50 Match & More vouchers – more than 85% – came from the price match promise that has now disappeared. New scheme: Only £10 in Match & More vouchers. Boo. Under the new scheme, Morrisons customers earn 5 points for every £1 spent, and get a £5 voucher for every 5,000 points. The agile mathematicians will have spotted that this means you need to spend £1,000 to get a £5 voucher. My £1,340 spend would therefore have generated one single £5 voucher under the new scheme, plus some points towards another one. Customers will continue to earn “More” points on promoted products. However, looking at the points I earned under the old scheme, once I scrap all the “Match” points from price matching, I am only left with enough “More” points from promoted products to earn one £5 voucher and get half way towards another. So rather than the £50 I received in Match & More vouchers under the old scheme, I would have received just £10 under the new rules – £5 based on my total spend, and £5 from points on promoted products. Ouch. I’m missing that £40 already. Even assuming I was still given the same £32 in random other coupons, my savings are halved to 3% (£42 divided by a total spend of £1,360). Of course Morrisons reckons that they will be offering lots of extra points tied to promoting specific items in store. However, I’m willing to bet there won’t be too many extra points offered on the kind of products I buy most often, like loose fruit and veg and a weird and wonderful array of Morrisons Savers stuff. From my perspective, the only good thing about the new scheme was that I uncovered a few receipts when I went shopping without my loyalty card with me. I took the receipts along to Customer Services, and got credited with enough extra points to generate another £5 voucher. Small consolation. 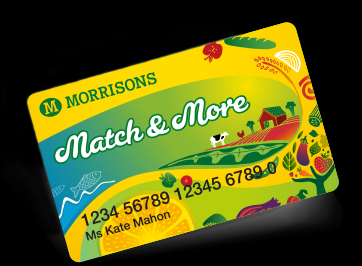 Anyone else irritated by the changes to Morrisons Match & More? Or just me then? Stand by for a further enthralling post in future, about which high street loyalty card is the most generous. Clue: I don’t think Morrisons Match & More is going to be in the running. I don't shop at Morrisons at all. I have completely boycotted them since last year when they made a very elderly poppy seller stand outside the door of one of their stores. They would not allow him to stand inside the store even though he was collecting in bitterly cold weather and his hands were blue. Lots of shoppers complained but nothing was done about it. 'Company Policy' was the only excuse, well it's my company policy NOT to shop at places I find treat anyone like this. … oh and I meant to say, well done on all that maths AND on keeping your old receipts so you could check things out.